MOUNTAIN VIEW, CA – The exhibit technology team at Bowen Technovation chose Furman's P-8 PRO II and AC-215A power conditioners to protect sensitive components in the control room equipment racks at the Computer History Musuem, used for flat-panel displays, touch screens and projectors throughout the museum's multimedia exhibits. The Computer History Museum, which has one of the world's largest international collections of computing artifacts, completed a two-year, $19 million upgrade in January. 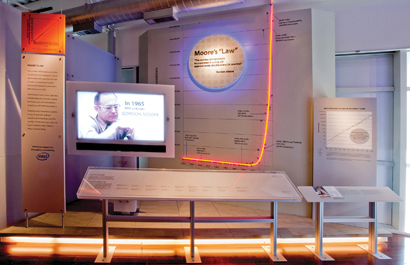 Its renovated building houses the exhibit, Revolution: The First 2000 Years of Computing. The new exhibit includes 100 multimedia stations incorporating flat-panel displays, touch screens and projectors. In addition, the museum's control room features 12 44U equipment racks housing a wide range of components, from media players and computers to amplifiers and Cat 5 extenders. "Power protection was vital to this installation," noted Bowen Technovation designer Brian Norris. "This is a very high-profile museum in a high-tech location, so equipment failure or poor performance is not an option. In addition, as the museum is located in California, rolling brownouts and blackouts are a concern. "To protect the equipment from damaging power irregularities while enhancing audio and video performance for visitors, we chose two different Furman products. For the equipment racks, we utilized 22 P-8 PRO II power conditioners, and 110 AC-215A compact power conditioners are protecting equipment in the exhibit spaces," he added. The 20A P-8 PRO II power conditioner offers eight rear-panel outlets and one front-panel outlet, zero ground contamination circuitry for the delivery of pure AC, and a BNC connector on the rear panel for the connection of any standard gooseneck lamp. The unit features Furman's proprietary Series Multi-Stage Protection (SMP) for comprehensive, non-sacrificial surge/spike protection; Linear Filtering Technology (LiFT) to reduce AC line noise; and Extreme Voltage Shutdown (EVS) to protect equipment from dangerous extreme voltage conditions. The AC-215A comes in a compact 1.75-inch by 5-inch by 8.5-inch design and weighs only three pounds. The unit's low-profile design makes it ideal for mounting to the back of a flat-screen television, or anywhere that discretely located remote power protection and purification are needed. In addition to SMP and LiFT, the AC-215A features Auto-Reset EVS circuitry to detect dangerous voltage irregularities and safely power down itself and connected equipment in unsafe conditions. "Although this installation was in a newer building with an upgraded electrical system, you never want to take a chance on power protection," added Norris. "We chose Furman solutions because of our past experiences with their products, and we knew that we could count on their rock-solid designs. Furman has again met all of our expectations and provided flawless performance for our client." For more information, please visit www.furmansound.com.